From the Hancock County Courthouse, go southwest on Hwy 22 for 7.2 miles to the intersection of Hwy 22 and Main Street in Devereux. Turn right on Main Street and go 0.2 mile to Church Street on the left. Turn left and follow Church Street for 0.3 mile until it merges into Devereux/Jones Chapel Rd. Go left on Devereux/Jones Chapel Road and follow it for 0.9 miles to Warren Chapel Road. Turn right on Warren Chapel Road and follow it for 2.7 miles to County Rd 144 and the Warren Chapel Cemetery on your left. Turn left. After 2.8 miles and just before the top of the hill, turn right onto a dirt road. Follow this road for 2.2 miles. This road becomes very rough and hunters have erected cable barriers across some sections of this road. You will go past Pole Cane Creek (unmarked) with its pond on right after 2.0 miles, and at 2.2 miles after going up a hill, turn left. Go 100 yards following a faint path. Turn left following another faint path and go 100 feet. 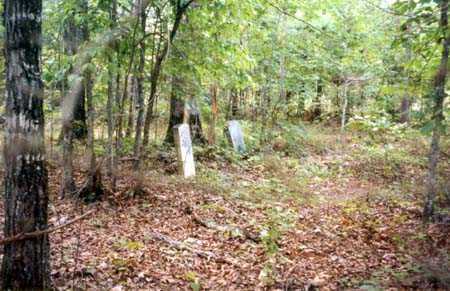 Turn right and the cemetery will be in front of you in the woods. Birth date and service below per family. No date or full service record on stone. was in the Virginia Militia (see below). m. Ruth Choice, who was d/o Tully Choice and Rebecca Sims, in 1823. All dates and relationships per family research (Lillie A. Chamlee, 1905-1981). b. [Lancaster], PA, [d. Hancock Co. Lived in Hancock for 42 yrs. Gravestone was stolen and his grave was re-marked in 2003] - Nancy Hart DAR and John Milledge SAR. Several other depressions in this cemetery.